As sure as the re-appearance of geese and flowers after our long bitter winter, Spring also heralds the arrival of the local travelling Carnival. Each May they squeeze into the neighborhood Community Centre parking lot, poised to extract as much cash as possible from obliging parents and rich tweens. 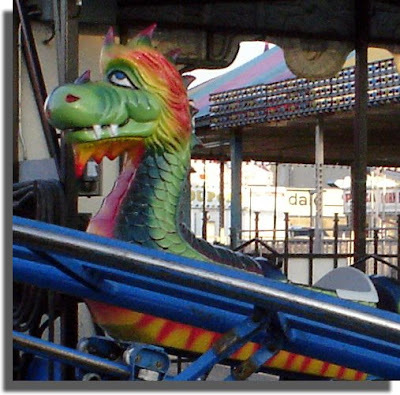 Years ago we took daughter on those kiddie rides... she loved it of course, but in milliseconds we could drop $50 on second-rate rollercoasters, substandard toys and wretched food. Since they assembled the Midway last night, I thought I would snap a few photos early this morning on the way to work. As soon as I stepped out of my car with camera in hand though, a burly Night-Security-Guard / Roadie appeared as if out of thin air. Surprisingly though, with a smile and friendly wave of approval, he let me walk around to capture the colors of the Fair. I wanted to get real close for some artsy-fartsy weird angle shots, but I didn't want to press my luck with him scrutinizing my every move. At least I got some nice closeups while everything was uncharacteristically serene. Because in a few short hours, the Amusement Park will burst to life with loud music, flashing lights, screaming kids and the distinct aroma that all outdoor festivals seem to exude. I have such a soft spot for those traveling carnivals. 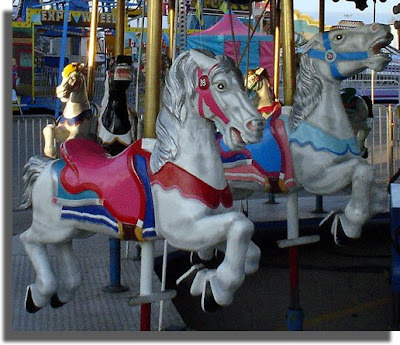 In my home town the daughter of a really snobby local woman ran off with a carny when she was a teenager - good times. You forgot the one thing that makes it all worthwhile... Mini Donuts! I will definitely have to stop by the Forks when I'm in town for a bag (or two). Somehow dropping 50 bucks at these places doesn't feel so bad. It's like spending Monopoly money. I love your pictures. Such stunning and vivid colors. Really pretty! I am a sucker for those. And did somebody say mini donuts????? And then of course I remember being up on the ferris wheel with the kids and they stopped "The Zipper" ride to hose down one of the compartments as it was full of puke. Really makes you want to be the next pair in that one! You know what I totally miss about carnivals and fairs? FRIED DOUGH. For some reason you can't get it here in CA. But every fair in Boston had them. 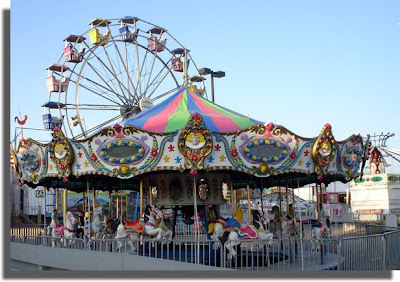 When I even see a picture of a merry-go-round or ferris wheel, I smell fried dough. Dammit I want some!!! I love a good candy apple. All covered with nuts. The pictures make me want to run out and find the nearest carnival and jump on a roller coaster. We had one in a local park at the end of last summer - it rained a bit and the entire grassy area got churned up. It's still not entirely recovered..
Great pictures! 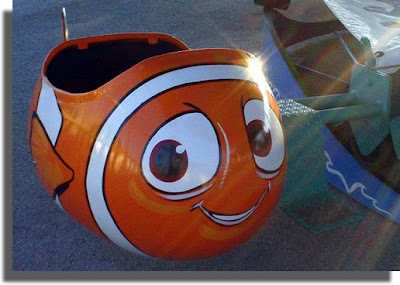 I love "Evil Nemo." For me, the best part of these carnivals is the food. Greasy, sugary, terrible, junky carnival food. And lemon shake-ups. Ahhh . . . spring! I loathe the carnival. The smell of the grease turns my stomach and it's always so hot when ours comes to town. According to my daughter, though, that is where the Doodlebops live, so I'm sure we'll be dragged back there this summer. Ugh. You can drop so much money on rides, games, hot dogs and cotton candy that you won't have money left over for the gas to get home! I still love these carnivals and my husband can not stand them. He says they are a waste of money and a death trap waiting to happen. SO I never have anyone to go on rides with or walk around and try to win my pathtic stuffed animals. We have Carnival on the Wii and that is as close as I can get him to one of those places. Great photos! You probably wouldn't have gotten anything like them had the carnival been open. I know what you mean. We've moved up to the mega-expensive indoor water parks--$50.00 or more per person and that doesn't include the pizza, pop, and the video arcade. Or the beer I consume--yes, they have a bar there where you can watch your kids in the wave pool. Still have a few minutes left here today... just in time to sneak in a Happy Mother's Day! Hope you had a great one! Don Mills Diva: Har! That’s a great story! Ashley: Ah, yes. Mini-donuts… unfortunately, the local Carnivals don’t have them! I guess we’ll BOTH have to go to the Forks when you are in town! Ann(ie): Yeah! Mini Donuts!!! You wanna join us? VE: Ew… my absolute major reason for avoiding even going NEAR certain rides…. BusyDad: Fried Dough? Ooooh… not so good for that W8Loss Wednesday!!! DJ: Yeah, they are for kids, definitely. Noorje: Luckily, daughter has hubby’s constitution… I am the “official holder of things” and watch while they would take the rides as I can’t stomach most rides. Susiewearsthepants: Candy apples! Now I think they DID have those! Lady Banana: Usually it rains, and hard when the Carnival is in… this year it was great weather for a change! JD: Heh, heh… Yeah, I didn’t realize his “look” until I chose the photo later. Ooooh, “Lemon shakeups” now that sounds like something I would like! Andi: Yes, it’s an experience all right. And parents being dragged by kids is a common sight there. Momo Fali: That is so true! Phoenix5: Thanks! Hope you and yours had a great day too. Jeff: Thanks! Yes, I did have a good day; I was hoping just to blog hop, but it was not to be… it was great though!